Once in a while I get a hold of a piece of gear that just makes good sense! These gloves are that kind of gear! A while back, my friend Chris Stewart, aka "TenkaraBum", started carrying Little Presents fishing gloves on his onine store at TenkaraBum. I already had two other pairs of cold weather fishing gloves, one pair of old ragg wool no-finger gloves, and one pair of synthetic open-ended mittens by Marmot, so I really didn't need yet another pair of fishing gloves. However, I'm glad I ordered the LP gloves from Chris! Chris has a great description of the gloves on his website. I was pleasantly surprised to see the gloves were available in olive green color, in addition to black. 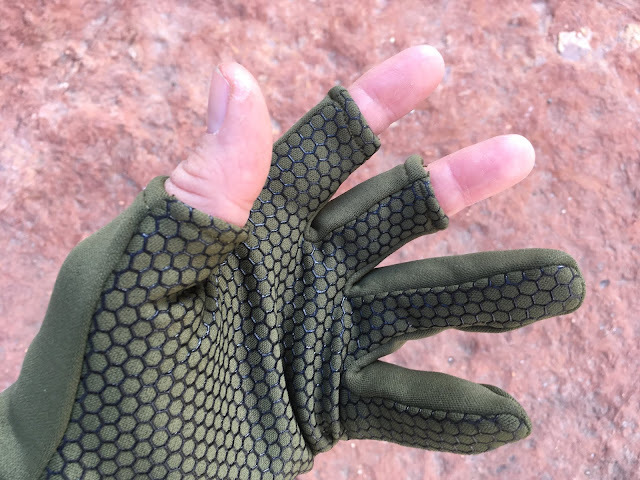 I have way too many pieces of gear that are the standard industrial black color, and the olive color of these gloves fits in well with a lot of the clothing and layers I fish in. I found the palms of these gloves quite grippy, but the webbing pattern isn's stiff at all. That's a complaint I've had with other gloves that have a non-slip palm, especially as the gloves get older and the non-slip coating gets more brittle. In Chris's description of the gloves he says, "one size fits most", and I found that to be true. I have small hands, and the gloves fit me well and weren't overly loose. They're stretchy enough to fit all but the biggest hands. I have a feeling these new gloves are going to get quite a workout early this spring! If I'm out on a REALLY cold day, I can always slip a fleece mitten on over the LP gloves. If they get wet, I can wring them out, put on a dry spare pair of gloves, and hang them on my pack to dry. That shouldn't take long, since they're synthetic. In all these Little Presents fishing gloves are a winner! Rehydrating kasha on my Bushbuddy Stove. My go-to backcountry meal! 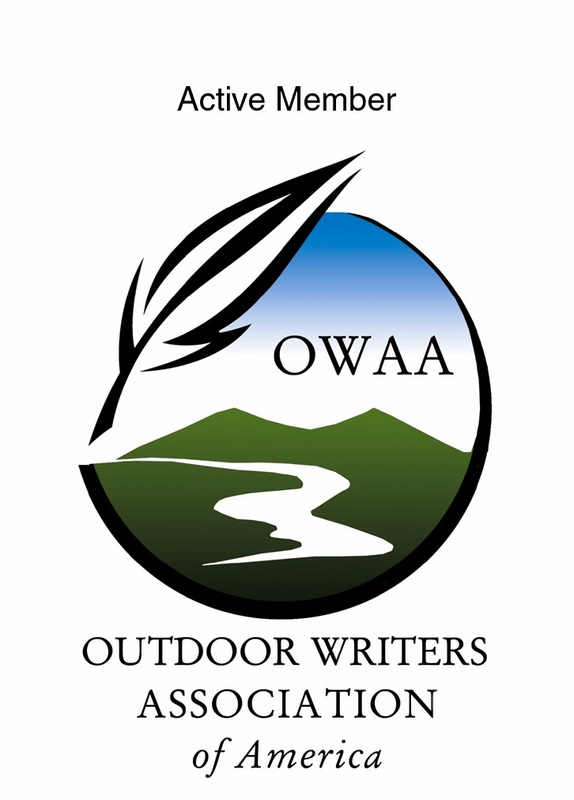 I've had a multi-year blog series entitled "Gear I Use", which features various lightweight backpacking gear, tenkara rods and lines, and other highly useful items I pack into the backcountry. Until now, I really haven't given thought to sharing the meals I use while backpacking and guiding in the boonies. With this new series, I'll share homemade recipes, preparation and storage tips, and nutrition information. I hope you'll find something of value here, and that it'll make your taste buds sing, even if you're sitting under a Engelmann spruce at 11,000 feet, high on a ridge in the Colorado Rockies, in the pouring rain! 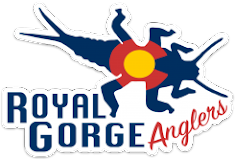 A couple of months ago, while working the Royal Gorge Anglers booth at the Denver Fly Fishing Show, RGA founder Bill Edrington and I quickly started discussing food and cooking, as we usually do when we spend more than ten minutes together. 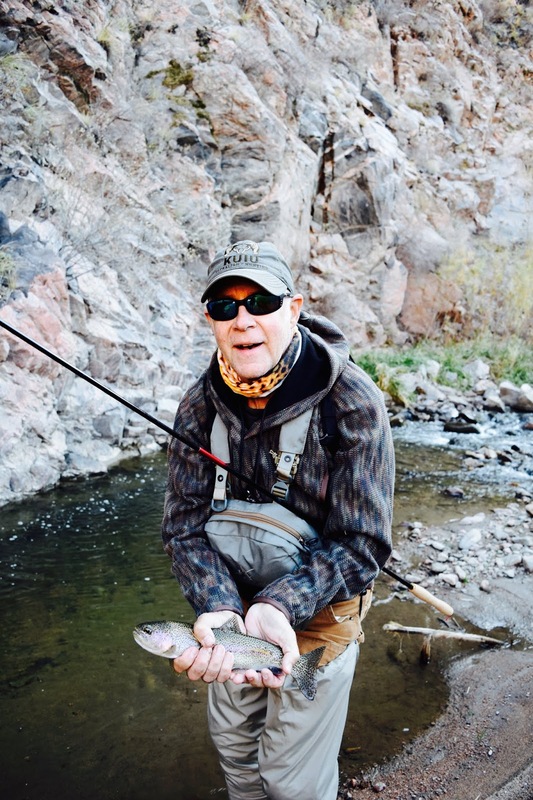 Bill used to write an interesting column in High Country Angler Magazine (the now out-of-print online-only Colorado Trout Unlimited magazine), entitled "Tight Lines and Tasty Spoons", which was based on his blog of the same name. The only thing Bill loves to do more than fly fish is cook (and eat well), and in that he and I have much in common. It was my conversations with Bill about food that got me thinking about sharing my backcountry food with others on my blog. I have a number of bulletproof meals that are suited for backpacking, and I also use them for the backcountry fly fishing trips I guide each year for Royal Gorge Anglers. Some of them are only prepared for backpacking, and others are tailor-made for full-day guide trips. I'll share a bunch of them here, and explain the differences. Kasha. In simplest terms, it's a a buckwheat-based porridge. It's been around for at least a thousand years, and has historic roots in Central and Eastern Europe, especially Belarus, the Czech Republic, Poland, Russia, and Ukraine. Kasha is generally made of toasted buckwheat groats, with a wide variety of ingredients added, although in the Slavic region it can also be based on wheat, barley, millet, oats, or rye. I have focused only on kasha made with toasted buckwheat groats. In historic Russia, kasha was made either savory or sweet, by using either water or milk as a base. I prepare my kasha the savory way, and only use water, simply because water-based kasha is better suited for dehydration. More on that later. While Russian kasha is served as a side dish, mine ends up being a one-pot meal. So, I've taken a very traditional Eastern European side dish and adapted it into a backcountry meal staple that includes both vegetables and meat. I have no doubt that historic Siberian promyshlenniki, those 17th and 18th century traders, trappers, and craftsmen, added meat and available vegetables to their kasha as well. One-pot meals, prepared over open fires, just make sense to an outdoorsman, whether it's 1719 or 2019. As you'll see, kasha has excellent nutrition, which is needed when living outdoors in the wild. I've read, and re-read, the wonderful book, Notes of an East Siberian Hunter, and can find no mention of kasha. However, given it's historic widespread use all over Eastern Europe and Siberia, I can't see why those folks didn't eat it. **Note: make sure your meat and vegetables are diced up nice and small. It really helps rehydrate and cook up better later on if you are going to dehydrate your kasha. If not, leave it big and chunky. In a non-stick deep dish fry pan, pour the buckwheat into the preheated pan. Toast the groats until they start to "pop" (watch them closely, you'll see them wiggle and crackle). This is just before they get hot enough to smoke. I like to stir them often during this toasting. It only takes 5 minutes or so. Buckwheat groats during final toasting. Stir in the olive oil and add the onions. Continue to sauté the onions until they start to soften. Then dump in the mushrooms and sauté just a bit longer. Once the onions have softened, pour in 2 cups of water and drop the bullion cubes in. Season with your choice of spices. Stir, cover, and simmer for about 15 minutes (at 5,400 feet elevation). If you're lower elevation, it won't take as long. I test the groats for doneness, and I like them soft, but firm. If you need to add a little water along the way to get the groats done, do so. Dump in the Brussels sprouts, meat, and spinach. Season it some more, cover, and turn down to low so you can heat the whole thing up. I like my finished kasha to be about the consistency of thick oatmeal. It's a certain "goopiness" that lends itself well to dehydrating, which is the final step. I usually can't stay out of my kasha once it's cooked! Once it's done and set off the stove to cool, it's time to lay it out in your food dehydrator. A batch of Sawooth's Kasha, ready for the dehydrator! I have an old Nesco American Harvest food dehydrator that has paid for itself many times over. I really like the one I have because you can fine tune the heat setting. I line the trays with parchment paper, and spread the kasha out over the lined tray until it's about 1/2"-3/4" thick, filling the entire tray. You can really get a lot more food in the dehydrator if you fill up your trays. A batch of kasha will fill about three trays, and you will have plenty left over to have it fresh for supper! I run the dehydrator on 150F temperature for around 12 hours. You will find that the Brussels sprouts take the longest of all of the ingredients to dehydrate. When they're dry, you're done! 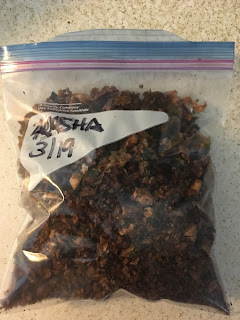 Once the dehydrated kasha has cooled, I pack it into 1-quart Ziploc freezer bags, and stick it in the freezer. You can leave it out of the freezer in a cool, dark place, but because it has some olive oil in it, I like to have it in the freezer. It'll last for months, and beyond, if stored this way. You can also vacuum seal it to make it store even longer. When I'm cooking it back up in the backcountry, I use 1 part dehydrated kasha to 1 part water. This will cook up nice and thick, and will come closer to the consistency it was when fresh, rather than a watered-down soup. Either are tasty, but I like my kasha thicker. Adjust your water accordingly when cooking it back up. 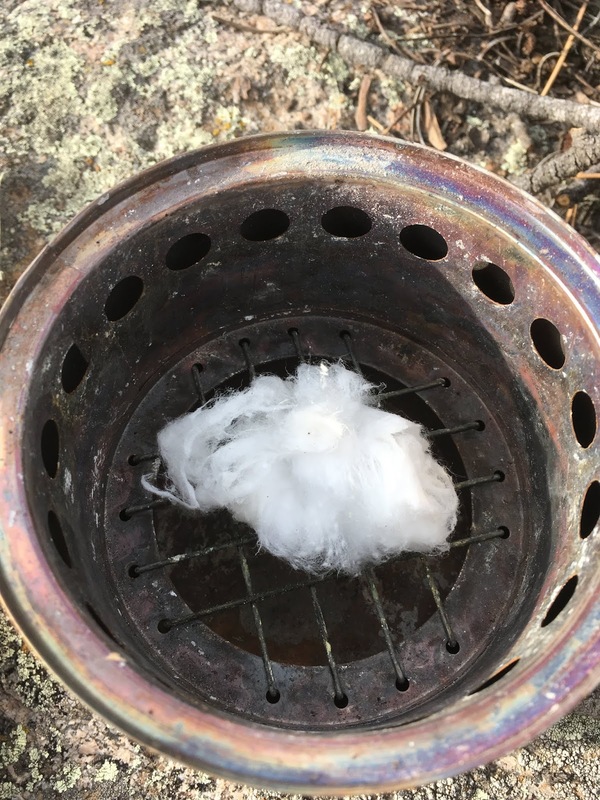 I've found it takes about 10-15 minutes to boil it up on a gas backpacking stove, Bushbuddy, or open fire, to get it done. Once the meat is tender it's done. (mg): Na - 3.0, K – 380, Ca – 20, Mg – 200, P – 298, Fe – 6.7. Vitamins (mg): B1 – 0.01, В2 – 0.43, РР – 4.19. Energy value – 355 kcal. Many years ago, Patrick Smith and I arrived at a 100 cal./ounce measurement for really good backcountry food. I think, with the right ingredients, kasha will meet that measurement. It's easy to prepare, tastes great, dehydrates and rehydrates well, and has some deep history as a staple for adventurous outdoorsmen. In all, it's my go-to meal! Enjoy! 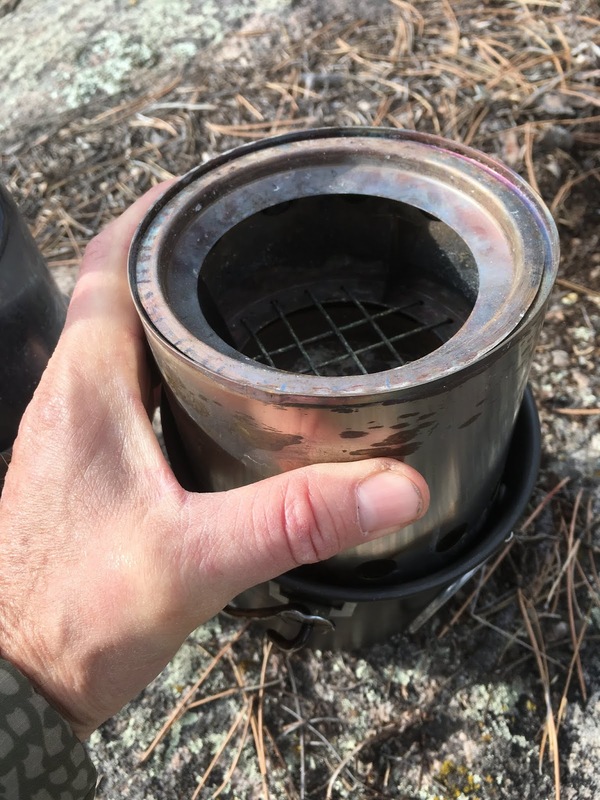 Quite a while ago I wrote about the various stoves I use, and this blog post is about the one I use the most when I'm out solo, the Bushbuddy Stove. Cooking up a batch of potato soup on the Bushbuddy Stove. 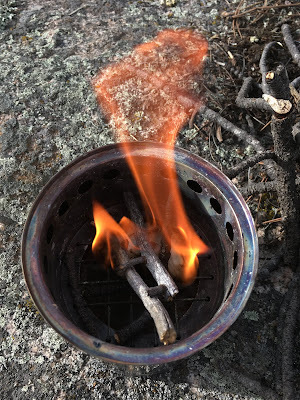 First and foremost, with a Bushbuddy (a gasifier type ultralight wood burning backpacking stove), you don't have to carry any fuel because you're surrounded by an unlimited supply of fuel (twigs, pine cones, bark, and assorted biomass). This is important in and of itself for several reasons. The absence of white gas fuel bottles (which I would use for my MSR Whisperlite) in my pack logically equate to lighter pack weights. The absence of iso-butane fuel canisters (which I would use for my Pocket Rocket or Coleman Exponent F1) also mean lighter pack weights, as well as eliminating the waste of discarded empty 110g or 220g canisters. Lighter pack weight and no wasted empty fuel canisters! Low impact on both my back (pack weight) and the environment (discarded fuel canisters). cooking up a batch of dehydrated kasha with brussels sprouts. Secondly, the Bushbuddy has very little impact on the environment. 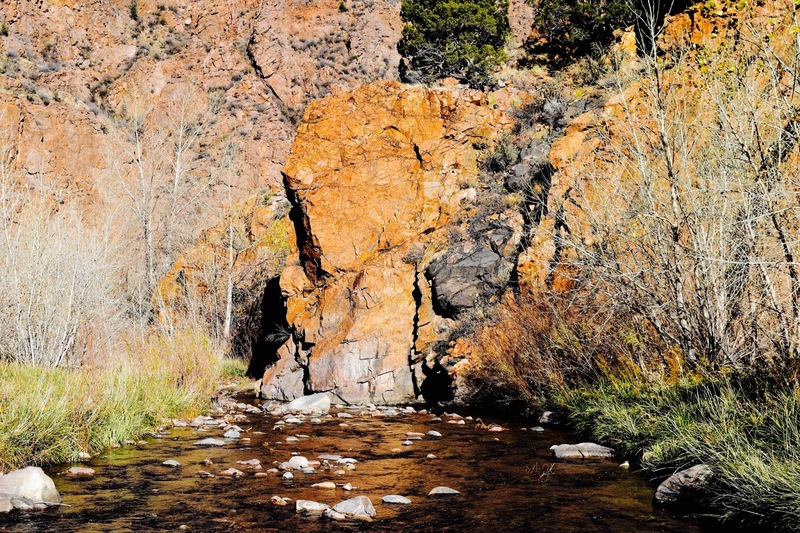 This is especially good in the canyons where I explore, fish, and guide tenkara trips. 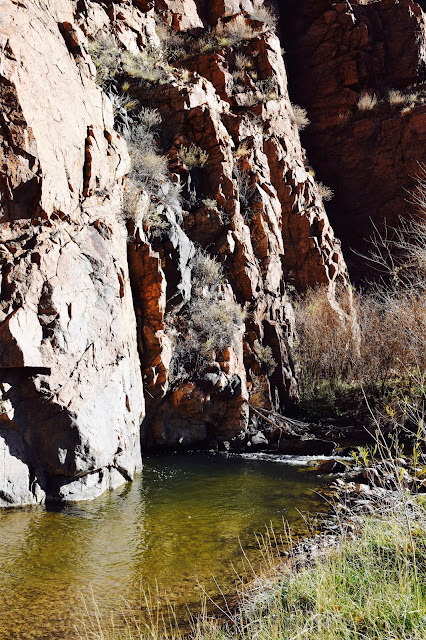 By the time Lieutenant Zebulon Pike poked up into these canyons in the winter of 1806-1807 during his southwest expedition, Native Americans had already been doing so for hundreds of years. Fire rings dot the narrow riparian zones along the creeks in my canyons. Because the Bushbuddy stove is a self-contained fire-powered stove, there's no need to use the old fire rings or make new ones. It's literally a "Leave No Trace" way of cooking with fire. Because the Bushbuddy uses small twigs, pine cones, and bits of bark, the impact on the dead and downed trees is minimal, and requires no unsightly cutting of branches with a hand saw or chopping of wood with a hatchet. Again...low impact, this time on the local environment. The fire starter I use the most with the Bushbuddy...cotton balls soaked in Vaseline. Third, the Bushbuddy stove has become an integral part of my cooking "system, and I've found a couple of cook pots that it nests into, saving space in my pack. I had been using titanium pots made by Snowpeak for many years, but in the past few years I've migrated to the hard anodized aluminum pots offered by Don Kevilus over at Four Dog Stove. Don's purpose-driven 1.1L Mors bush pot, originally used by the bushcraft legend, Mors Kochanski, is a perfect fit with the Bushbuddy stove. It's this duo that claims a spot in my backpack, and they are tailor made for each other. I will be covering ideal cooking pots in a future blog post, but rest assured that the Mors camp pots made by Four Dog Stove are bulletproof and affordable. The Four Dog 1.1L Mors bush pot. The Bushbuddy nests inside it perfectly! Lastly, the Bushbuddy stove is handcrafted by an acquaintance of mine in remote interior Alaska. It's a US-made, small batch piece of gear, crafted by a couple who live off-grid near Tok, Alaska. This is no late-to-the-party offshore cookie cutter knockoff made by workers who will never know how it's used, or even the genius of its design. Originally developed and handmade by Fritz Handel in Canada, and then passed down to his apprentice, Jeff Tinker, the Bushbuddy is truly a homespun piece of gear. I have much in common with Jeff, and his wife, Belle. We both heat our homes with wood we cut and split ourselves, although their needs in Alaska eclipse those of mine in the southern Colorado foothills. We both enjoy doing things our own, self-supported way. The stainless steel stove material Fritz Handel originally used, and is now used by Jeff, was first given to them by my dear friend Patrick Smith, founder of Mountainsmith and owner of Kifaru, International. I highly respect Jeff and Belle for the lifestyle they've chosen, and it's very satisfying to fire up my Bushbuddy stove, knowing that Jeff and Belle's hands were the only ones that touched my stove before it arrived on my doorstep. As for the crafting of the Bushbuddy stoves, all of it is done by Jeff and Belle. According to Jeff, Belle does at least half of the work. Jeff does all of the forming, drilling, grinding, and welding of the outer shells, pot supports, and fireboxes. Belle does all of the material processing, which includes shearing stainless steel pieces (they get them in bulk rolled coils), cutting out discs for forming, hammering out pot supports and ash pan tabs on the anvil, welding all of the ash pans and heat shields, and etching the logo on the bottom of the stove. Belle also processes all of the cardboard used for packaging. All while caring for a 16-month-old baby while pregnant with their second child. My respect for Jeff and Belle goes beyond the crafting of the Bushbuddy stove, as it takes Jeff around 20 hours a week just to keep up with the demands of living an off-grid life in remote Alaska. Add that to the 2-3 hours it takes the two of them to produce just one Bushbuddy stove. I'm both amazed by their grit and ingenuity and thankful that there are people in this world like Jeff and Belle! I couldn't be happier with my Bushbuddy stove (made by Jeff and Belle several years ago, under the previous Nomadic Stove label), and the history and deep workmanship that it represents, going all the way back to Fritz Handel's original hard work, and all way up to the present with the crafting of these wonderful stoves by Jeff and Belle. I've said it before many times...utilitarian ART! 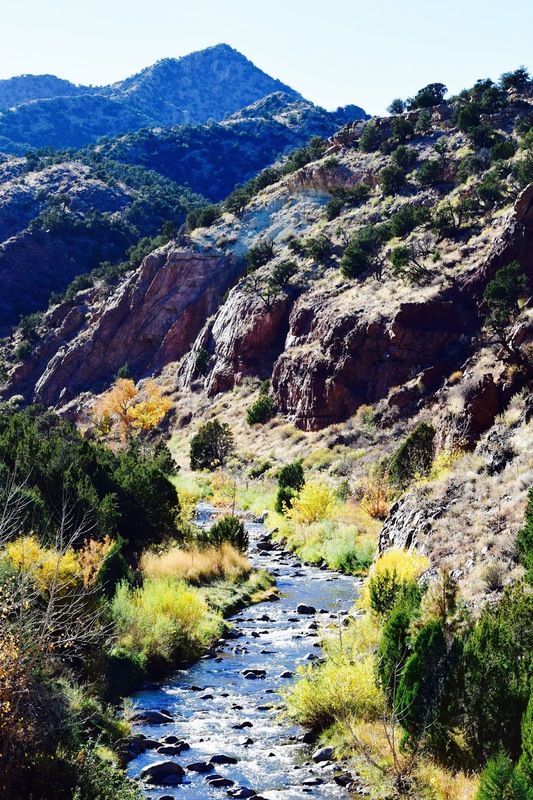 It's shoulder season in the southern Colorado foothills and canyons. It's that time of year when you can run the air conditioner and the heater in your truck all on the same day. One weekend it can snow six inches and the next one you can go for a trail run in shorts. There are windows of opportunity to get out into the canyons in pursuit of browns and rainbows, and you have to grab those windows when you can. Winter storms are in the forecast, but not quite here yet. Coming tomorrow. Navigating my truck down washed-out switchbacks and bedrock to the bottom of the canyon, and then back up the opposite wall to a hidden pullout. Getting out of the cab, I notice the so-called road was so rough it rattled my gas cap open. A good friend meets me at the pullout, his own truck dusty and disheveled from the trek. We've fished together in the canyons, and beyond, even to Alaska. Conversations begin where they ended weeks or months ago. We gear up and start the thousand-foot drop down the canyon wall to the creek. 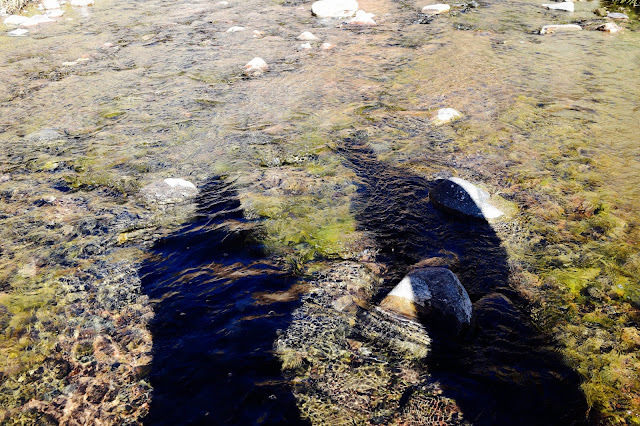 Old knees and worn backs welcome the weight of wading boots and backpacks. Our bones and muscles know this routine well, and we know this is the easy part...we will have to climb back out at the end of the day. The water is low and gin clear. 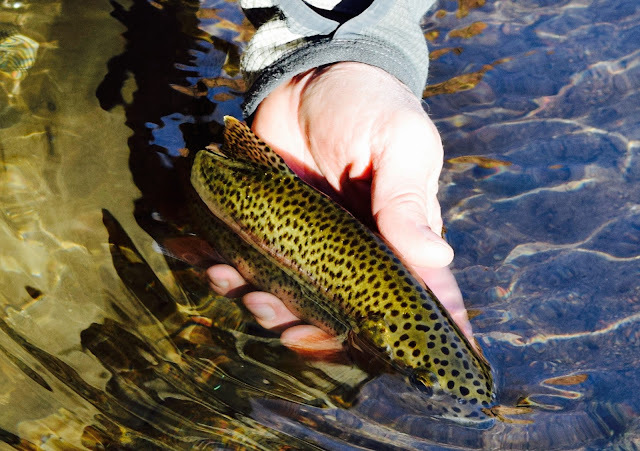 The browns and rainbows are holed up in the bend pools...spaces between cold rock and deep water. They aren't picky, and they know they have the same windows of opportunity to eat what they can before the winter ice closes off their world for six months. Hard takes on Killer Bugs, Beadhead Squirrel Nymphs, and RS2s. It's an exceedingly good day. The sun sets early behind canyons walls, and the temperature plummets. 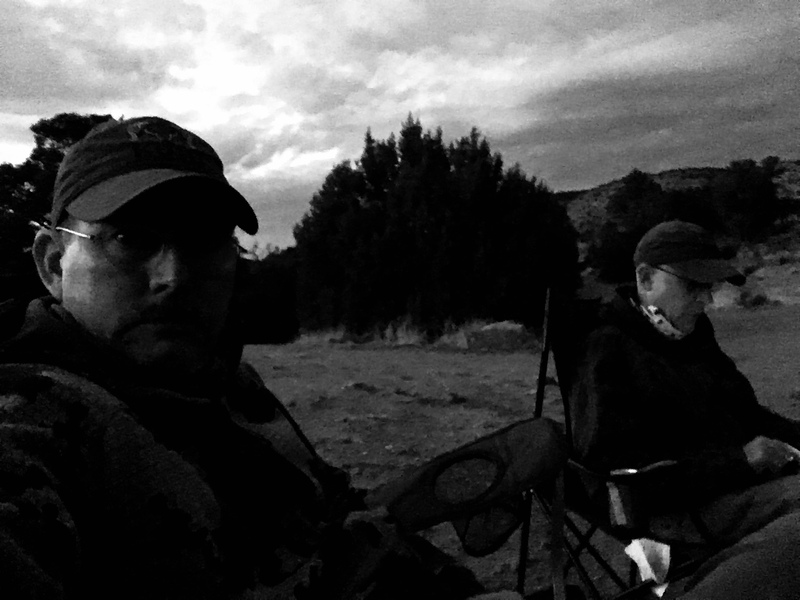 We climb the thousand feet up and out of the canyons, chests heaving and brows sweating, sad to be leaving Once on top of the wall we sit in the dark drinking beer, discussing the day, the fish we caught. 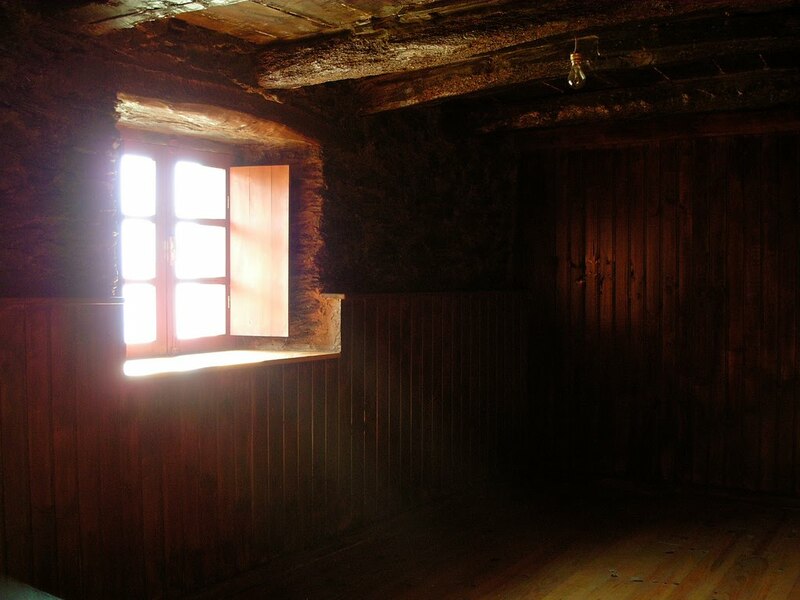 We feel fortunate to have had this window of opportunity! I'm sitting here on my patio five minutes from the banks of the Arkansas River. We've already had measurable snow this month. There's a foot of desicated, brown, crunchy maple leaves in the backyard. The shadows are getting longer, the days are getting shorter, and it's my absolute favorite season of the year! It's that same season that calls to me every year, urging me to get with the program and get firewood cut and split, get elk anchored to the ground and in the freezer, and get out onto the water to grasp what remaining fishing can be done before winter sets in. There's both a soothing relaxation of the season, and a haunting reminder that it'll all be wrapped up by Mother Nature, whether I like it or not, in the next few weeks. I heard (or read) somewhere that the same Mother Nature saved all of the beauty of the other three seasons and dumped it into this one all at once. I tend to agree. Golden aspens and long afternoon shadows! This fall has been blessed with success and fraught with failure. I'll take them both in stride and keep on trucking. First of all, I've been fortunate enough to spend some really great days out on the water, enjoying Indian summer and catching a lot of fish. Secondly, I've been struggling with some injuries caused by a 20-plus year career in the Army, that raise their ugly heads a couple of times a year, and those injuries made me miss my wilderness elk hunt during the first season here in Colorado. You just cannot haul 150 pounds of boned-out elk meat out of the backcountry in a backpack with nagging, decades-old problems with your lower back, not to mention the wear and tear of 40 years of backpacking. So be it...I know where those elk live, and they aren't going anywhere. I'll be back after them in a late season hunt this year when there's plenty of snow on the ground. Back to autumn fishing. 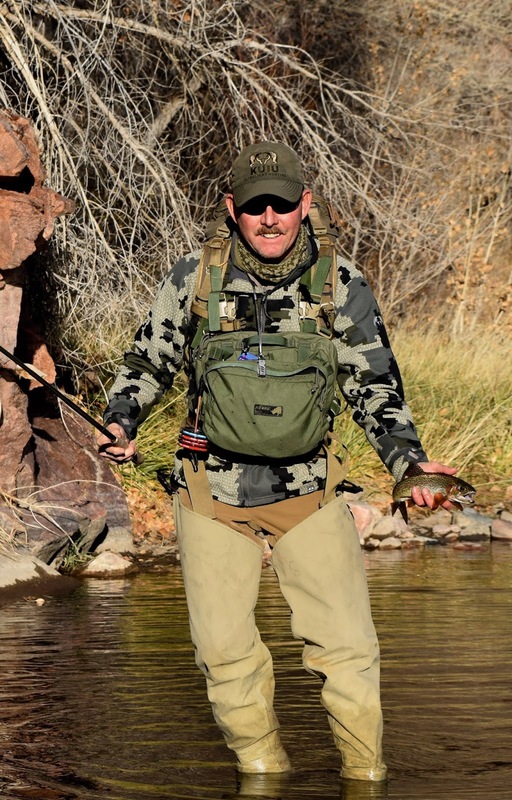 After a good guide trip in early October with some awesome clients, I was able to get out into some higher canyons for a full day of fishing. Just prior to that trip, I had made the Tactical Tenkara Nymphing (TTN) line I designed public, offering it exclusively through the fly shop I work and guide for, Royal Gorge Anglers. It was a whole lot of fun to take that same capable tenkara line out into the canyons this fall for some small water nymphing. I had been testing and tweaking that line for nearly three years on water ranging from my tiny canyons and larger rivers here at home in Colorado, to streams in southwest Wisconsin's Driftless, and then all the way up to Alaska where it worked amazingly well on trophy Alaskan rainbows. Most of my big water nymphing is done with the standard 12-foot TTN, including the fishing I've done in remote Alaska. However, I've also dialed in the taper of this weight-forward line to a shorter overall length line for small water nymphing here at home in my canyons. It was this shorter line (in this case an 11-foot length) that I used this fall for some stellar fall fishing at home. The heart and soul of small water nymphing, my 11' TTN! A couple of fall trips to tenkara waters really stand out this year. One was very close to home and the other was a few hours away. Both of them were a celebration of this brief season here in Colorado, and a thoughtful comparison of solo fishing and the camaraderie of fishing with a friend. I happen to guide with some very talented folks, who also happen to be very good friends. 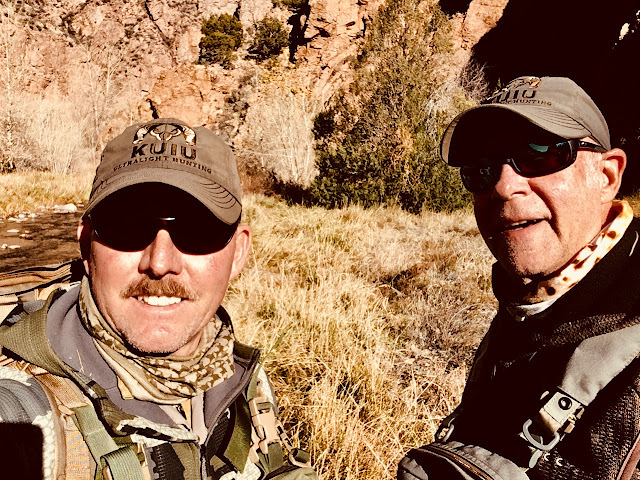 This past season, my busiest ever, was spent guiding some group trips (enough clients to warrant two guides) with a couple of solid fellow fly fishing guides. One of them, Joe, has been my fishing partner on more than one "guides day off" fishing trip this year. We partnered up for one such trip in mid-October this year. We headed up to around 8,500 feet to one of our favorite canyons. I really didn't know what expect up there, because I just hadn't had the time to scout it at all this year. What I did know was that there had been widespread low water this year in all of the canyons, but of all of the canyons I fish close to home, this one was one of the highest in elevation. That would give us lower water temps, and hopefully higher flows. My estimations were correct, and Joe and I found conditions just about perfect for a day of small water canyon fishing. 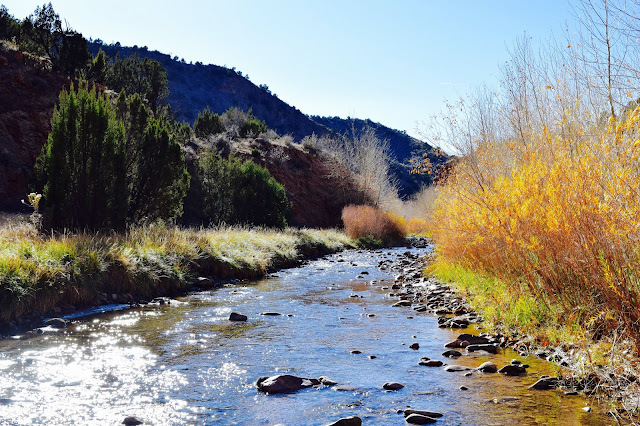 The aspens were golden, the cool fall air was refreshing, and the brown trout were hungry! A beautiful fall drive in my Tenkara Taco on dirt roads to the canyons! On this particular trip I took along a Zen Tenkara Suzume, my favorite small water rod. I nearly always fish this rod at it's fully extended length of 10'8". I teamed this rod up with my 11' TTN line, with about 3' of tippet, terminating with a #16 olive Bead Caddis tied by my friend, Rich Osthoff. I put one #4 splitshot about 9" in front of the nymph. It was a simple, lightweight nymph rig, perfect for small water nymphing! A rock-solid small water rod! Rigged up for a full day of fall fishing. Rich Osthoff's wonderful little nymph. I stopped counting fish at around 30. It was a great full day of fishing with a good friend. The Colorado fall colors were vibrant, and the air was cool with a hint of the coming winter. It was a simply amazing day! The next fall trip that really stands out is my annual pilgrimage to Estes Park and Rocky Mountain National Park. Our family has been making this trip, on the same weekend each year, for a very long time. We usually rent a cabin in or near Estes Park, and this year was no different. 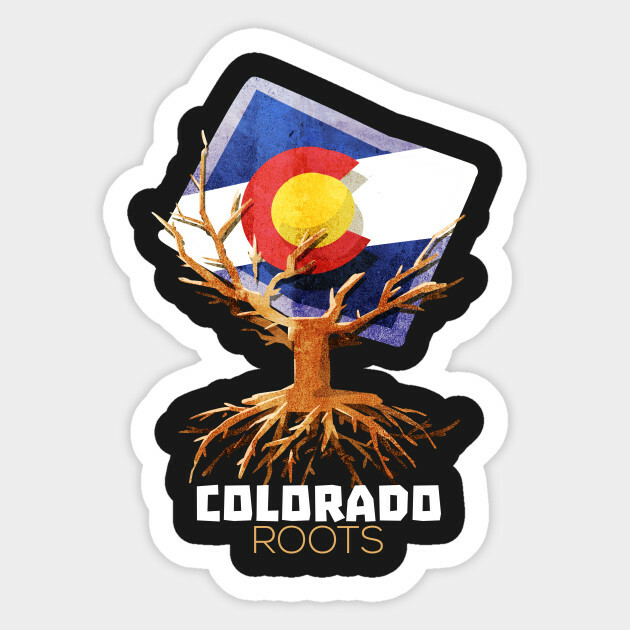 We had room in the cabin for our immediate family and a few guests, including our oldest daughter who's attending college at Colorado State University in Ft. Collins, about an hour away from Estes Park. Each year, I'm able to spend a whole day during this retreat fishing in Rocky Mountain National Park. Passing through my Stomping Grounds, en route to Estes Park. Mule deer in the yard at the cabin in Estes Park. My normal routine is to get up before dark, brew coffee and eat breakfast, and then head into Rocky Mountain National Park for my fishing day. Over the years, I've spent most of my time fishing the Big Thompson in Moraine Park and Forest Canyon, and fishing Glacier Creek below Bear Lake. This time around I headed back to my regular spot on the Big Thompson at the upstream end of Moraine Park, and started fishing up. If you fish this way on that section of the Big T, it becomes increasingly overgrown with Douglas fir, blue spruce, willow, and western river birch. Thankful that I was casting a relatively short tenkara rod (the Zen Suzume), I kept fishing upstream until I finally had enough of the spider web of tippet-catching vegetation overhead. In the process, I caught a dozen or so brook trout on the upper half of this stretch, and half as many browns on the lower. Luckily, I had enough time left to head over to Glacier Creek, so I at my lunch on the bank of the Big T in Moraine Park, and then headed back to my truck. A glorious view of Moraine Park! The Big T, near the entrance to Forest Canyon. The headwaters of the Big Thompson River. An upper Big T brown. After fishing the Big T, I drove out of Moraine Park, enroute to Glacier Creek on Bear Lake Road. At the downstream end of Moraine Park the park rangers had set up a roadblock. Once I got to the head of the long line of vehicles, the ranger informed me that because every single parking space had been filled between Moraine Park and Bear Lake, they were turning all traffic away for about an hour. In all of the years I've been fishing Rocky Mountain National Park, and that's a lot of years, I've never seen this happen! A view of Longs Peak from near Deer Ridge Junction. After pulling a quick u-turn at the roadblock, I drove up to Deer Ridge Junction, down into Horseshoe Park, and drove up along Fall River and parked just below the Alluvial Fan. It's a good quarter-mile hike across the grass and marsh of the valley to Fall River, but it was worth it! After the devastation of the last flood on Fall River, I was a little worried that it may not have fully bounced back yet. I was pleasantly surprise to find a LOT of trout in the river. Bright sun and no shade along the river (the exact opposite of Forest Canyon) made it challenging! In all, I've had a very enjoyable fall season of tenkara! I don't think it's over yet, but we're close. There are sometimes brief windows of balmy weather even into December, and when they come along I'll jump on it! But for now I have a hot wood stove heating our home, six inches of snow in tonight's forecast, flies to tie, and tenkara lines to make. Life is good!